Private Boarding Facility Located in Woodcrest. 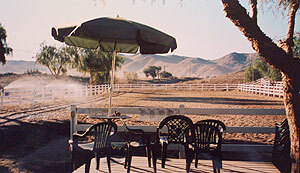 offering a comfortable and fun environment for you and your horse. Board openings available to persons and their horses in a minimum of a part or full time training or a part time lesson program of at least 2 lessons per month with either of our resident trainers Lindsey Smith or Arika Condon, or clinic with Jill Beltran 2x per month. Retired horses welcome however you must pay for a stall as we do not have 24 hr turn out, only half days 5 days a week. Our pastures are dirt. and turn out times can change with additional horses here. Trailer-ins welcome for lessons, training and clinics - Trailer-in fee applies. Our barns are well lighted. w/consumption indicators, mist system and fans. 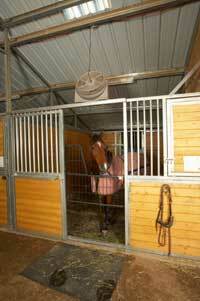 Total privacy for mare and foal. Foaling barn has 2 fans. Fed three times a day Alfalfa and/or Teff. We offer wood shavings at our facility. Box stalls include 8 bags of shavings per month. Additional bags of shavings can be purchased for an extra $24 per month (1 bag of shavings per week). *Additional bags can be purchased at $7.00 per bag. (Bag price subject to change at any time). & Miles & Miles of Trails! Please Note: Children are welcome at Liston Stables. However, children must be under adult supervision at all time! Liston Stables does not provide child care on grounds. 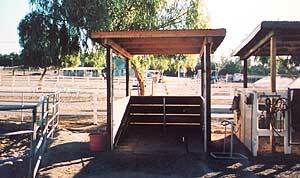 It is boarder's responsiblity to provide responsible supervision for your children while on site at Liston Stables. At no time may your children be left unattended.